Exporter of a wide range of products which include Manufacturing Execution System, Integrated Enterprise Management & Control Execution System, Production Data Management System, Energy Management System, Comprehensive Security Monitoring System and Remote Production Monitoring System. MES system is in the middle layer of a three-tier architecture, mainly facing the under manufacturing plant level,making the process characteristics very obvious. It is based on either production orders issued by the ERP system or long-term plans, through operation planning, operation scheduling, material balance, cost accounting, a quality management process to organize the production, and the reporting of ERP system data. DFMC MES system comply complies with international MES industry standards ANSI/ISA-S95, and manufacturing execution systems (MES) national standard specification SJZ 11362-2006. With 12 functions, and 15 modules, it achieves automation of internal production process management, which has important significance to management efficiency, management activities, and management assessment. The program will bring office automation work flow technology into the MES system, therefore, MES systems not only provide traditional production monitoring and statistics, and report output, but also provides an activities platform for the production and management, of activities that achieve online office, online scheduling, online coordination, and online management through this platform, thereby greatly improving the efficiency of production management. Integrated Enterprise Management & Control Execution System is absorbed in production management and automatic control of flow type enterprise. It analyzes and calculates the control parameters, controls and instructs the production process and equipment based on the product requirements and detects data. The system can also forecast product index according to measurement data of the production system, and provide large closed-loop production instruction and control of integrated management & control systems between the automation system and the final products. It can adjust and execute the feedback fluctuation of the product index automatically without manual intervention, and resolve the relativity problem between product objective data and production control parameters. It is the most innovative information management and control system at present. The Production Data Management System is an integrated information system which generates production information assembly, storage, transmission, statistics, analysis, and delivery. The on-site production state can be viewed directly by graphical interface, and it provides powerful decision analysis for all level managers. It also plays an important role in convenient production planning creation, operation plan adjustment and optimization based on practical production, transmission of product instruction and supervision of planning execution. Metallurgical and mining enterprises are enterprises with high energy consumption, besides, energy operation systems and use status shall have significant impacts on enterprise costs. Real-time control of energy consumption can help companies find potential safety hazards. The system achieves centralized management of the energy, integrates with measurement systems, and timely collects actual performance of energy. Managers can maintain complete control of the energy operation, carry out scientific scheduling and effective energy analysis,and support management decision-making. The energy management system provides many functions including: energy measurement, forecasting, planning, scheduling, monitoring and analysis, enables enterprises to establish a set of energy forecasting models and energy input-output models for businesses, optimizes the energy structure, and achieves maximum energy efficiency. Meanwhile, through all kinds of energy indicators, it analyzes product energy consumption, tons of overall ore energy consumption and process energy consumption, etc, promptly takes measures to improve the efficiency of the energy system. Energy information automated processing, energy information table and graphical analysis, and energy information dynamic inquiry. Data collection provides a combination of automatic collection and manual input, and promptly displays energy distribution in the working position in the form of an energy network diagram. The energy management system provides a variety of development and statistical methods, carries out calculation, comparison and analysis referring to energy consumption plan, shows results to users in graphical form, helps users monitor the implementation of energy plans according to the current actual production, and makes appropriate adjustments if necessary. It coordinates the energy supply, including outsourcing and self-produced energy. It not only meets the energy needs of the production process, but also reasonably avoids peak load, thus the purpose of cost savings is achieved. The centralized and distributed storage of collected energy data ensures data continuity, integrity, security, reliability, and consistency. Energy monetization and indicator assessments are used to accumulate and gather the collected energy data, and then form and analyze graphs of energy itemized consumption for the leader's reference. The integrated protection monitoring system is an important part of the substation integrated automation system, which primarily provides real-time remote monitoring for the substation integrated automation system, sounds alarms and records abnormalities, delivers statistical storage of all kinds of energy data, and provides raw data for energy cost statistical accounting of enterprises while conducting safety monitoring. It provides flexible alarm modes: the alarm point can be flashing, change color, produce animation and sound effects. It provides alarm including: overrun alarm, accident alarm, condition alarm, and various types of alarms which can alert the corresponding station or information chart to start the accident remembrance and print. Many enterprises have realized real-time display of equipment and production state via the automatic control system, but still expect to timely check equipment and production states through office network. With dynamic WEB technology, the remote production monitoring system implements real-time remote monitoring to production flow, process parameters and various production indices through the network, so that the manager receives effective information on time and is able to conduct corresponding analysis decision and monitoring. It provides data interfaces for automatic collection control and detection systems and manual recording, carries out data gathering, statistical analysis and release of automatic collection and manual recording, then, implements real-time dynamic production and control monitoring at the network terminal for different forms of data, report forms, figures and pictures. The system has the ability to provide real-time tracking and monitoring of the production process data and inspection data calculations, assays and quality. Users achieve supervision and management through the remote monitoring system. The manager can check current and prior direction in time through the vivid dynamic simulation process diagram and a real-time historic direction diagram, and provide an irregular production warning at one time. Beneficiation production falls within one kind of on-stream continuous production, so not only the online control system but also the online management system covering online cost accounting, input and output analysis, production index accounting, etc. are needed. Integrated management and control system for beneficiation has solved the integration problem between production and resource management management and the automatic control of production lines. In most cases, the management of the stock ground was carried out manually in the past, where the incoming and outgoing materials were recorded manually, with huge workload, and the inquiry, statistics and other work were very complicated, making it easier to make mistakes in management. And as for the control of material piling and taking equipment, many of them were still at the manual control stage. Based on the investigation and research on the stock ground, the universal integrated management and control system for stock ground is developed in combination with management and automation control, thus making the stock ground management march forward into the informationalized and automatic management era from manual management. Aiming at keeping the blast furnace under stable operation conditions, the Iron Smelting Expert System adopts the expert system technologies to realize blast furnace status prediction, dynamic analysis of data, self-adaptive optimization control and optimization of operation instructions. Based on current parameter changes, the system can make comprehensive calculation according to historical parameters and get real and reliable inference results, so as to control the operation of blast furnace or guide the operators to make operation, reduce abnormal conditions, accurately judge the abnormality and dispose of it rapidly. Monitoring the operation of blast furnace and other equipment, mathematically analyzing the blast furnace smelting, diagnosing the blast furnace operation status by expert system, carrying out self-adaptive optimization control and auxiliary operation, optimizing the blast furnace operation parameters, scheduling and managing the iron-smelting production, etc. This system has provided the blast furnace operators with a comprehensive optimization platform for automatic control and operation direction. It has provided technical assurances in keeping the blast furnace under continuous and stable operation conditions, realizing high-strength smelting (to increase the utilization coefficient by 0.1t/d.m3 to 0.3t/d.m3), reducing coke ratio (to reduce the comprehensive coke ratio by 20-30 kg/t), cutting down consumptions, prolonging the service life of blast furnace and stabilizing hot metal indexes. Sintering Expert System combines optimization control modeling, with an expert system core to realize manual intelligent optimization control of sintering production. It replaces manual data analysis with a high-performance server group which calculates the technological parameters and end production state, controls equipment, amends errors and stabilizes the process depending on the result of the expert system optimization. The system resolves the problems of long lag, strong coupling, non-linear capacity, large changes in sintering material component and quality, and lack of direct detection data etc. To stabilize sintering production, reduce consumption, and ensure sinter ore quality, the system provides automatic proportioning control, self-adaptive moisture control, solid fuel expert system control, ignition control, and sintering BTP (Burn Through Point) expert system control. It also provides analysis control functions for heat status analysis, permeability control, material balance control and return sintered ore balance control, which enhance the control effect. It adopts methods of time traceability and expert system prediction to resolve the problems of long techniques flow, and large delays in assay results. According to sintering theory, the system builds a comprehensive analysis model of heat status, permeability and return sintered ore balance, to resolve the sintering production stability. It adopts the machine learning technology to optimize sintering process control parameters. By combining a "machine material flow" control algorithm with the control methods of permeability and initial temperature point BTP prediction, it accomplishes effective control of the sintering terminal and the big closed loop control from feed proportioning to finished product. The coking and coal blending expert system is a management-control integration system to achieve coking production optimization. The system is based on data mining and expert system techniques. It normalizes the coal storage management and coking production process, resolves optimized coal blending calculation, vitrinite calculation, and coking quality forecasting, while ensuring reasonable material coal application. Blast Furnace Operation Execution System: the stability of blast furnace smelting needs a stable operation system. Examples include: hearth heat system, blowing-in system, slag-making system, loading system, fuel injection and elevated top pressure. Therefore, it requires a suite of systems to manage and standardize the operation, ensuring each blast furnace operation method is consistent, and provides blast furnace stability. Personnel management enhancement is the key measure needed to improve control, because blast furnace control cannot occur without the operator. Blast furnace operation and execution systems have the function of blast furnace and personnel operation recording, which provides "blast furnace operation and control replay" which provides the important ability to enhance operation level and personnel responsibility. 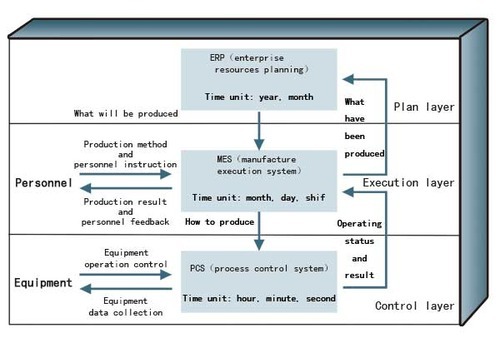 The design of an Enterprise Resource Planning System is based on the core idea of lean production, and agile manufacturing. It takes into account the double need for prior planning and subsequent controlling of events, examines and standardizes the enterprise business processes, eliminates the duplication of labor in business process, achieves standardization and normalization of business processes, provides data integration, prohibits randomness of business processes, and thereby strengthens the fundamental work of enterprise management, further ensuring quality of work. Guided by the principle of automatic data collection, organization, and processing of enterprise information, it establishes the complete management networks among human, financial, and material portions of enterprises, thus achieving organized flow and strict management of enterprise resources. Because data processing is completed by the system automatically, accuracy and timeliness is greatly increased, and the analysis is standardized and consistent; not only do they reduce the intensity of work, but also free managers from trivial matters, but also allow more time to study problems found in business processes, and allows research and applied modern management methods to improve management and promote the wide use of modern management methods in enterprises. Enterprise Resource Planning System follows the enterprise through continuous upgrading and development.